Metal Beds There are 146 products. A modern take on a classic, the Crystal Bed features a brightly coloured finish and beautiful crystal finials. Constructed from steel, the Crystal Bed is finished with a powder coated paint process Crystal Metal Bed Black has A sprung slatted base gives natural bounce, adjusting to where pressure is most exerted to provide greater comfort. Panache Crystal Metal Bedstead is made by Metal & Glass Finial,Available in either a black or white finish,The Panache Bedstead has a scroll feature to the head and foot ends, giving an extra sculpted look to an already striking bed frame and is finished off with crystal finials. 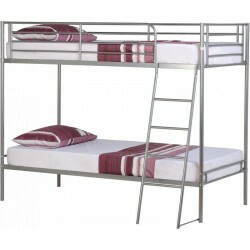 Elizabeth Titanium Grey Bed. Simply alluring. Available in different size. Nice Glossy White Bed. A perfect setting for magical dreams. Available in White with different sizes. Olivia Antique Brass Bed. An Antique Brass finish is applied to this classically shaped bed, which is rich in character and delivers a sense of presence to any bedroom. Available in Brass with different sizes. 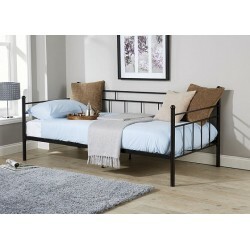 Luxor Anthracite Folding Bed. Folding out to provide a luxurious night's sleep. Available in Anthracite. This inspired four-poster 3’ bed will add a certain magic and charm to the look of a feminine styled bedroom. Quality craftsmanship and thoughtful touches are evident throughout and it looks undeniably beautiful presented in a sumptuous White Gloss. Available in White.